languagehat.com : Israeli Hebrew Imperatives. The first word אנא [‘ana] means ‘please’ (though only in the request sense) and the last word אלי [e’laj] means ‘to me’. The source of the mistranslation is the second word חיזרי, which can be either [xiz’ri] ‘return (imperative, singular, female)’ or [xajza’ri] ‘extraterrestrial (adjective)’.The spelling for the ‘return’ sense is typically חזרי, but it’s not that unusual to spell it with the vowel חיזרי. A more common spelling for the second form would be חייזרי, doubling the י to indicate that it’s used as the glide [j] rather than the vowel [i]. Regardless of the spelling, though, it’s surprising that ‘extraterrestrial (adjective)’ is more frequent than ‘return (imperative)’. For chazar, the historically imperative forms (masculine singular chazor, feminine singular chizri, and plural chizru) are not used (remember, I am speaking here about non-formal latter-day Israeli Hebrew; those three forms ARE used in formal Israeli Hebrew). I’m guessing that Yoav Goldberg has it right; if this translation came from a dictionary rather than from corpus analysis, then the lemma form /xajza’ri/ would have had an advantage over the non-lemma form /xiz’ri/ (lemma = /xa’zar/). Rather, the controlling factor is the location of the utterance (be it written or spoken) on the continuum of (in)formality. I’m curious to know what my readers have to say about it. Weird, I’m not used to being referred to as “Ari-Gur”. Feel free to call me “Ran”. > […] in non-formal latter-day Israeli Hebrew, that adjective and noun [the one meaning ‘extraterrestrial] is indeed more frequent textually than the feminine singular imperative chizri! And, well, it’s not rare in writing. Google-searches are, of course, very unreliable; but they suggest that /xiz’ri/ (as either חזרי or חיזרי) is about ten times more common than /xajza’ri/ (as either חייזרי or חיזרי). > For positive 2nd person requests, casual Hebrew mostly uses the future form, e.g. תזכור tizkor ‘remember’, with no subject אתה ata ‘you’ except for emphasis. I’m not sure quite what to make of this explanation — what does it mean for a usage to be simultaneously casual, elegant (but not formal), and brusque? — but maybe that will be informative for those of you who understand the vocabulary of register better than I do. For what it’s worth, Glinert does not explicitly call out a difference between writing and speech here. Future is cross-linguistically an ambivalent concept. It could be imperative as in go to hell!. It could be optative as in may you have a pleasant journey (fare thee well). It could be more confident as in a hard rain’s a’gonna fall. It could be conditional as in were it not for the government, I would become rich. I’m completely on Ran’s side. Several true imperatives are frozen in common modern speech (and much more so in writing), and x-z-r is definitely one of the more prominent ones – in both the formal “return my call” sense and in the romantic “come back to me” sense. Moreover, the high-register אנא which precedes it in this exemplar (common “please” is בבקשה, /bevakaSa/) should cause any conceivable language model to prefer the imperative. Re-reading the post, I see that the last point I made (אנא instead of בבקשה) also drops the ground under Gold’s claim regarding “the location of the utterance in the continuum of formality”. I’m no expert on Hebrew grammar, but day-to-day observation says that the high-register אנא ana (as opposed to the common בבקשה bivakasha) requires the imperative form of the verb. The noun חיזר xyzar (and not xeezer, which means ‘he courted’) is a synthesis of a noun/adjective and an adjective, and is, I believe, a portmanteau. חיים xayim is a noun (perhaps always) occurring in the dual form. It means life, and is the main component of the classic Jewish toast לחיים li-xayim, ‘To life!’ חי xay, the adjective, means living, as in ‘a living thing.’ זר zar means strange (adjective) or stranger (noun). This modern coinage means ‘alien’ in the sense of extraterrestrial. Modern Hebrew has come up with a number of these types of nouns: דחליל daxlil, scarecrow, from דחה daxa he pushed away, deferred, repelled and חלל xalal, (empty) space or void. Another is דחפור daxpor bulldozer, from דחה he pushed away, etc., and חפר xafar, he dug. Fascinating, I’m glad I asked! — There’s also the infinitive used as imperative; in this case it would be לחזור. The infinitive imperative is used when the addressees are unknown in number or gender, for example in written instructions or signs. It is also used to create a social distance between the commander and the commandee(s). The truncate imperative is much more common than true imperatives, where you can tell them apart. As people here mention, there’s complex interaction between the various ‘please’ words and the different imperative forms. bevakaša may occur after or before the clause; ana is more literary, and can be used in some contexts to distance the speaker from the audience; or, poetically, it can imply pleading. na is used only before infinitive commands, with the same sense of distancing. laševet (infinitive). A teacher telling the class to take their seats. bevakaša laševet. As above, but a bit more personable. laševet bevakaša. As above, but can also sound a bit impatient, with slight over-politeness for irony. na laševet. A chairman inviting committee members to take their seats. šev (m.sg. addressee, imperative form). A principal inviting a grade-school student to take a seat. A teacher sending a student back to his seat. šev na. Very literary. Not used in spoken language, and rarely in the written language since the 1930s or so. ana šev. Pleading for someone to sit down, as in ‘please don’t leave!’ The example in the LL post, ‘please come back to me!’ is of this type. tešev. (future form, m.sg.) Informal, with pragmatics depending on intonation. I imagine, perhaps, a manager or a military officer addressing someone slightly below them. With different intonation, a family member might use this to tell you to go ahead and take a seat while they are still on the phone. tešev bevakaša. A job interviewer inviting the interviewee to take a seat. bevakaša tešev. A teacher testily telling a student to sit down and shut up. *na tešev, *ana tešev. Ungrammatical. tšev (m.sg., truncated future) An invitation to a friend you see at a café to come and join your table. tšev bevakaša. A busy clerk or mechanic inviting you to take a seat. *na tšev. Ungrammatical and ridiculous. Should be “the truncated future”, not the “truncate imperative”, and there’s a period missing after the previous sentence. I’m Yuval and I approve Y’s examples. “tšev bevakaša” is borderline unacceptable – I’d prepend it with a question mark. There actually is a “na kra” (“please read”: na + imperative form). It’s quite formal, and seen mostly in license agreements and other such documents. The use of future as an imperative is ubiquitous for all but a handful of verbs in spoken Hebrew, and is found in the lowest written register (personal text messages and other “written-spoken” language). I work extensively with text at a slightly higher register (as an English > Hebrew translator), and have found that readers find the following to be equivalent, in decending order of formality: “na kra” > “ana kra” > “na likro,” in informational text. “bevakaša” would not be used in written contexts as a simple politeness marker with a verb. Are those tš sequences pronounced as affricates, or as stop-fricative sequences (cf. Polish czy, trzy)? Lazar—I’d say leaning toward stop-fricative, but there’s a range. The affricate sounds very sloppy to me, but maybe it’s normal for some people. I couldn’t even come close to reproducing the difference between TRZY and CZY. Most affricates on this planet have a single place of articulation. For instance, the English ch doesn’t really consist of an alveolar [t] and a postalveolar [ʃ] – the whole thing is postalveolar. The Polish cz is just such a thing. The Polish trz, on the other hand, is not. It really does begin with an alveolar [t] that is released into a postalveolar [ʃ]. If you say it too slowly, it comes out as [tsʃ]. The only other such case I know is the Tyrolean (c)k [g̊χ], a velar plosive released into a uvular fricative. Unlike the Polish situation, it does not contrast with a similar but better-behaved affricate. Postalveolar stops don’t seem to occur outside of Australia, and there are no IPA symbols for them. People usually resort to the symbols for palatal stops. @Paul Ogden: Not that it matters, but — חיים is actually plural in form, rather than dual: the first yud is part of the stem. You can tell because it’s חַיִּים /xa’jim/ rather than *חַיִם */’xa.jim/, with two yuds even in Biblical spelling, and also because its construct form is חַיֵּי־ /xa’jej-/ rather than *חֵי־ */xej-/. Lazar, on further thought, if the /tš/ is followed by a consonant, it will be affricated, e.g. [čma] < tišma ‘listen’. Another modern coinage similar to xaizar is xaidak “bacterium”, from xai “alive” + dak “thin, minute”. I don’t know if labriut (labrius?) even exists in Yiddish. Not likely. Health is געזונדהייט gezundheit (cf German Gesundheit “soundhood”), and in my childhood was the usual utterance heard after a sneeze. I am still confused on how Modern Hebrew managed to evolve such a large distinction between a formal written and informal register so quickly. Wasn’t Ben Yehuda’s revival based on a written register? I find the avoidance of imperative verb forms particularly interesting, since at least the Ashkenazi immigrants to Israel had come from mother tongues where imperative forms are an everyday occurence. Wouldn’t a Yiddish, Polish or German speaker latch onto the imperative form as “natural” when learning Hebrew? Are traditional Hebrew imperative forms somehow non-intuitive or often irregular? Does Arabic not use imperatives in informal registers? I always thought it was bizarre that “American r” was described as a retroflex approximant, because for me it has always been an alveopalatal approximant, like [ʑ̞] (that’s [ʑ], Polish ź, with a lowering diacritic). I can produce both this and the retroflex version, and I cannot hear the difference, but I definitely pronounce /r/ in spontaneous speech with my tongue tip behind my lower teeth. I wonder if in fact nobody can hear the difference, and so AmE-speaking children adopt whichever one they happen to produce first. A general remark: the disconnect between formal and vernacular in Hebrew is vexed in an interesting way, and this discussion highlights that. the word for health (and healthy) is gezunt. I’d say that gezunt is an adjective, based on the common sentence “Zay mir gezunt!” (Be healthy!) sometimes said in closing a conversation or as a marker of one’s departing a small gathering. John: I’m reluctant to assume that there’s anything about English that I know and you don’t, but English /r/ has many articulatory variations. You see a common division into ‘retroflex’ and ‘bunched’ productions, but Delattre and Freeman (1968) have sorted out eight different variants. Pure retroflex would be their type 8; yours seems like type 6 or 7, perhaps? Many studies on English (perticularly American) [r]’s have been done since then. The acoustic differences between them are in the higher formants, F4 and above, which are indistinguishable to most people, even children. Vanya, I haven’t read any good explanation for the disappearance of the imperative in spoken Hebrew, and it puzzles me too. My one guess is that the imperative is one more paradigm to learn, and if a second language learner has a reason to not learn it, they will. Another thought is that the negative imperative has always used the future form, e.g. al tešev! ‘don’t sit!’, never the imperative form, and perhaps that led to using the future as a positive imperative. Let’s try that link again. The later trilingual, unidirectional Harkavy . . .
Wow! I had no idea that edition was available online. Bookmarked and downloaded too. Hmm. My only comeback is that my grandmother, L1 Yiddish, always said “Gezundhayt” when I sneezed. I see that “the woman next door” is rendered on the last page of that later Harkavy as “di nekst-dorrikeh.” A phrase right out of the shtetl! An exclamation used to wish good health to a person, esp. to someone who sneezes. 1914 Everybody’s Feb. 484 ‘Saved your life,’ he murmured mechanically, as one suffixes ‘Gesundheit’ to a sneeze. 1942 O. Nash Good Intentions 124 Mr. Weaver said ‘A cashew’, and the man said ‘Gesundheit’. 1959 H. Pinter Birthday Party ii. 37 Goldberg (lifting his glass). Gezunteheit [1960 ed. : Gesundheit]. 1961 L. Payne Nose on my Face xvi. 252 Saunders sneezed suddenly. ‘Gesundheit,’ said Jim. In New York and other cities, there were the opsterzike(r) and the donsterzike(r) as well. But, couldn’t Americans have acquired it from Yiddish? It is surprisingly common, in fact, I would say that very few Americans don’t know the word. I am still confused on how Modern Hebrew managed to evolve such a large distinction between a formal written and informal register so quickly. I’d never really thought about this, but you’re right, it is somewhat puzzling. I’d guess that part of the answer is the large gap between the traditional genres of written Hebrew and the needs of everyday speech, which left both a need for new constructions and lots of space for them to sprout. This doesn’t explain the differences in lexis, though: for example, many or most interrogatives in Hebrew have a formal and an informal version; I don’t know how that distinction originated. The truncated imperative doesn’t seem mysterious, though; pretonic reduction together with the frequent resulting syncretism with the future form, which makes good semantic sense, can account for that. But, couldn’t Americans have acquired it from Yiddish? As Ben explained above, it’s not a Yiddish word. I can produce both this and the retroflex version, and I cannot hear the difference, but I definitely pronounce /r/ in spontaneous speech with my tongue tip behind my lower teeth. Huh. I find the difference between that and the retroflex version easy to hear; there are effects on surrounding vowels. Well, my mother used to explain to her classes how it was necessary to enunciate very clearly in German, and described English as the language you speak without moving your mouth, which is almost true if you exclude labials. More so in the US than in the (southern?) UK, where I’ve watched people actually moving their jaws when they speak. 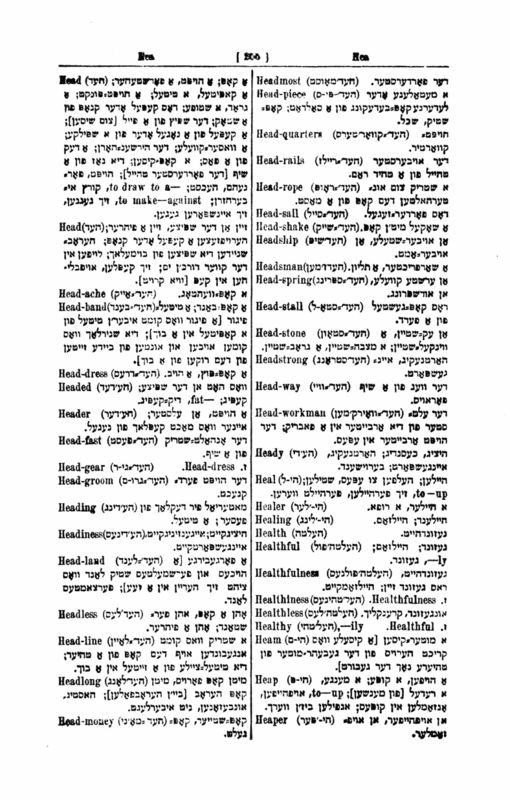 Curiouser and curiouser: The ten oldest hits, in Hebrew newspapers from 1860 to 1871, refer only to individuals whose surname is Gezundheit. In 1871 the word appears twice, but in brackets after the Hebrew word for health, בריאות. Following are scattered mentions, 44 in all from 1860 to 1919, and then 138 between 1920 and 1939. Only two mentions from 1940 until 1964. So 75 percent of the hits occur in the interwar period. If a major sneezing fit wasn’t the cause, what was? Probably this referred to the fact that, in Standard German, with the optional exception of Dr., unstressed vowels can only be reduced if they’re spelled e (…never mind cause and effect). That’s why we wouldn’t dream of confusing, say, Effekt and Affekt. Well, exactly. And how do you say Affekt without opening your jaw for the “a” and closing it some for the “e”? I think the “bunched” and “retroflex” /r/ sound different to me as well. James Marsters has a bunched /r/, right? I can pronounce Affekt satisfactorily to my own ear while holding my teeth together on edge. Paul Ogden: Fascinating digging results; kudos. The timeline is certainly bizarre. I wonder if this reflects a general boom in Jewish publishing in the interwar period, so that the preceding gesundheit noise is amplified. Until the twentieth century it was not uncommon for Jews to write (and print) German in Hebrew letters, though the interwar period is late for that. And how do you say Affekt without opening your jaw for the “a” and closing it some for the “e”? I think I outsource that to the tongue. Not to the lips even – I just spent a few seconds in front of the mirror and saw no difference. Speaking German with completely closed jaws sounds just a little strange; it does not cause any loss of information.